Feeding Habits Analysis: Clash of the Titans – Ya Like Dags? It’s been a little while since I’ve added to my world-famous series of posts on spiny dogfish gut contents, but today I found something that proved to be entertaining for the entire lab, and perhaps a little heartbreaking for some. Those of us in the fish world like to play a little game called “my study animal can eat yours,” and there was but one contender left in the lab that had yet to be conquered by the mighty spiny dogfish. Today, I personally witnessed the knockout blow being delivered to that last contender, and in impressive fashion. If there’s any fish out there that is held in higher esteem by recreational fishermen than the striped bass (Morone saxatilis), I haven’t seen it. In North Carolina you’d think that the only fish in the sea were striped bass or red drum, with stripers as the clear favorite (occasionally North Carolinians will talk about sea trout or marlin, but that’s usually only to tide them over until the next time they can bring up striped bass). It’s even worse up in New England, where the next most famous fish is the Atlantic cod, which is revered more for its food value than fighting spirit (cod are a really fat, dumb, boring fish to go after by hook and line). The Rulifson lab includes a few striped bass enthusiasts working on ageing and otolith microchemistry for the species, and as you can expect there is a bit of a friendly rivalry between the bass people and the dogfish people. I had heard anecdotes of stripers being devoured by dogfish (but then again sooner or later dogfish eat everything, right?). I’d even seen striped bass coming up as scattered data points in a diet study I’ve been looking over. However, hearing about it and actually witnessing the aftermath are totally different things. Today one of my stomach content samples contained 85 grams of fish chunks covered in dark skin and scales roughly the size of my thumbnail. These scales had an unmistakable pentagonal shape and a distinctive “triangle” pattern leading down to the focus. Yes, Virginia, this dogfish had ripped some chunks off a striped bass. And from the size of the scales, a big one. The smoking gun. 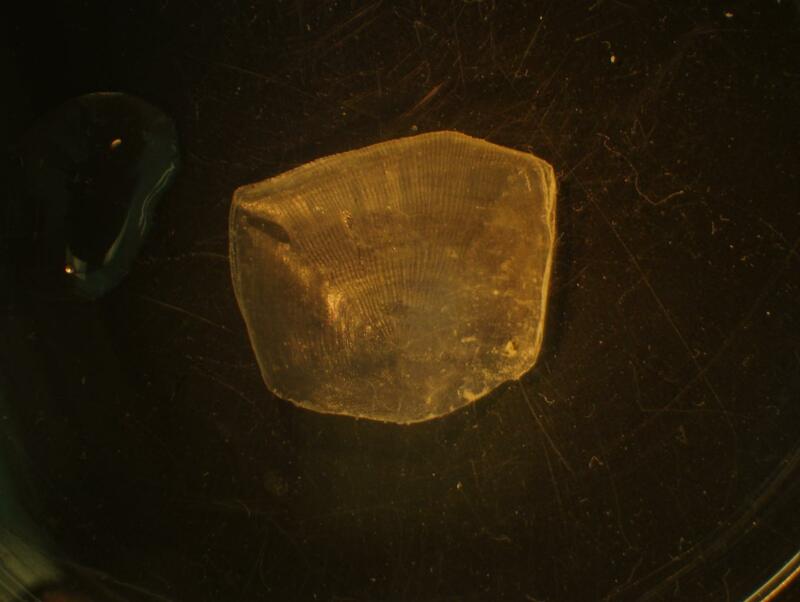 One of the striped bass scales recovered from the stomach contents of a 78.5 cm spiny dogfish. After verifying with lab-mate and striper ager extraordinaire Jeff that these were, in fact, striped bass scales, we decided out of morbid curiosity to figure out how old, and therefore roughly how large, this unfortunate bass had been at the time of consumption. By Jeff’s count there were between 9 and 10 growth rings on the scales (we kept them and made an acetate slide of them as well in case anyone else ever wants to verify that count), which, according to him and chief striper fan Jacob, would correspond to a striped bass between 80-100 cm in length (31.5-39.4 inches for those who are anti-metric). A big frigging bass, and here’s where it gets awesome. 1-The striped bass was grabbed off a hook or bitten while being brought in by an angler. This is pretty common behavior for any species of small coastal shark. 2-It was munched out of a gillnet while it was still fresh. Again, not an uncommon practice for a small shark and also the reason I chose not to use gillnets for my study. 3-A school of striped bass and a school of spiny dogfish were feeding on the same bait ball of menhaden (other sharks from the same tow had fresh menhaden in their stomachs). One dogfish (possibly CH-16-03) missed its target or just plain got hungry enough to attack a larger fish and nailed one of the stripers. Sensing injured prey, the other nearby dogfish pounced on the wounded bass and tore it to shreds. Ultimately it’s impossible to know which of the above scenarios actually happened (though all three are plausible and I find # 3 the most entertaining), but what we can find out is very interesting: a spiny dogfish fed upon a significantly larger striped bass. It’s neat what you can find out from shark puke. As upper piscivore predators, spiny dogfish and striped bass occupy a similar position in the marine food web, which makes this an interesting example of intraguild predation. I go over it in a little more detail in this post, but the basic idea is that intraguild predators are in both a competitive and a predator/prey relationship. In this case dogfish and stripers may compete for the same species of forage fish, but in a pinch dogfish are completely capable of carving up some bass too. However, there’s no real need for recreational fishermen to start an outcry about culling dogfish to protect striped bass stocks, since this seems to be a relatively rare incident. In 245 stomachs analyzed so far, striped bass has appeared in exactly one of them. Now if you don’t mind, I’m going to go catch a citation striper and use it for dogfish bait. I think option one or two are your best bets. I mean nobody really believes a dogfish, or any other shark for that matter, could take down a striped bass, with out the assistance of humans. Obviously it was laser herring. Pingback: AFS 2011 – Big Ol’ Recap | Ya Like Dags?